Nothing says summer like a Fresh Fruit Tart! It makes a beautiful addition to any dessert spread. Be sure to bring this festive treat to share on the 4th of July. 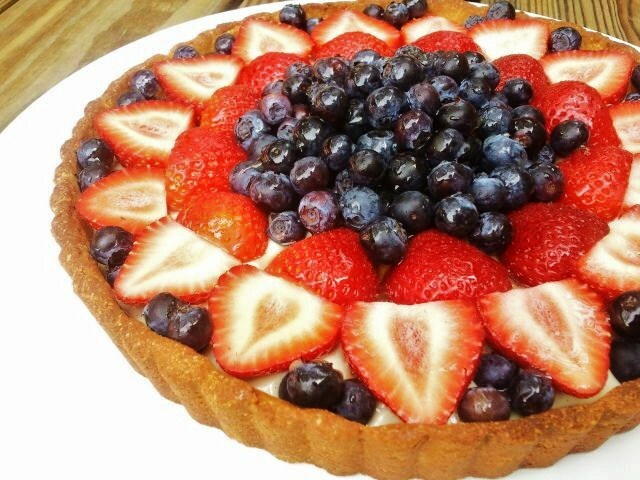 Fill baked and cooled tart shell with Dairy Free Vanilla Pudding. Place in freezer to allow pudding to set firmly. At least 30 minutes. Wash, dry and cut fruit and berries. Remove tart shell from freezer and place fruit on the layer of pudding. Arrange as fancy or freeform as you would like. The idea is to completely cover the pudding so you can’t see it. In a small bowl, stir together the honey and water. Microwave for about 10 seconds. Brush this simple glaze on top of the fruit for a nice finish. Keep refrigerated until you plan on serving. It can be assembled the day before. I love recipes that are simple to whip together, especially when I’ve spent all day working.